Nine liters of pressure canned juice was made from 22 pounds of peaches picked off my one peach tree. The peaches were perfect and fully tree ripened. For the last week the squirrels destroyed about half the harvest at night. Process: The pits were hand removed by squeezing into the cooking pot. The peaches were covered with water, cooked until soft, blended into a slurry, transported to the kitchen and strained through a 2mm mesh food mill. There was little residue, but this was put through the Champion Juicer to extract all the nutrients. The juice is sweet and most pleasant to ingest. The nine liters were pressure canned at 15 PSI for 15 minutes for long term storage at room temperature. Pictures delineate the process. 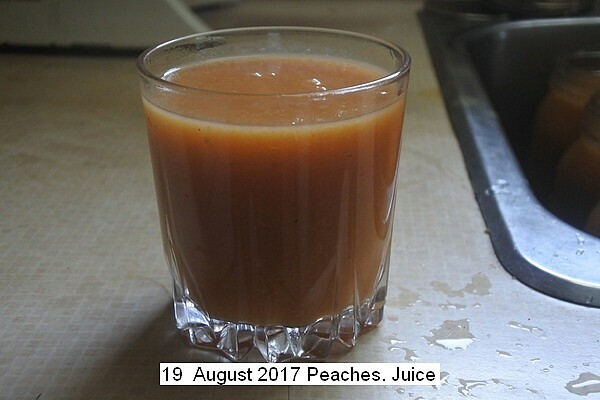 This entry was posted in Uncategorized and tagged 19 August 2017 Peach Juice, Peach Juice, Peaches. Bookmark the permalink.